Also be sure to visit our Dive Destination Guide by Location with detailed information about the top 35 dive destinations for underwater photography. How do you get to your favorite dive destinations? Your editor on the way to a dive site - the "Drop Off", camera on the lap. 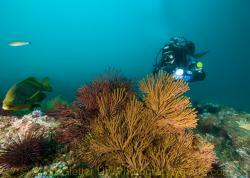 There are many great dive destinations in the world for underwater photography. Some are very hard to get to, and some can be quite expensive. This guide will expose you to what I think are some of the best dive areas that are accessible and fairly well known. Your own research may of course turn up new spots. Popular dive spots in the world for underwater photography include Anilao, Lembeh Strait, Bali, Sipadan, Papau New Guinea, Sulawesi, Raja Ampat, Galapagos, Cocos, Southern California, Monterey, British Columbia and the Red sea. Bunaken has great wall diving & corals, and some big fish. 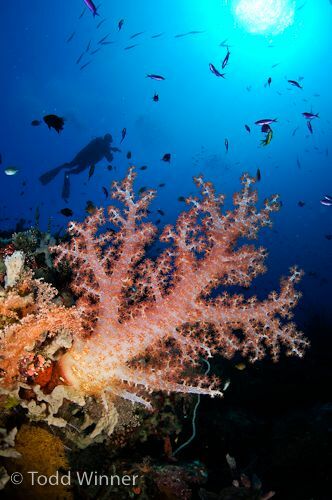 Siladen has healthy shallow coral reefs and great soft coral. The Solomon islands has some spectacular reefs, soft corals, mantas, huge sea fans, bumpheads barracudas, and large schools of jacks. Everyone that has been to the solomon islands rates it very highly for underwater photography, especially for corals and schools of fish. Fuseliers seen while diving Papua New Guinea, photo by Randy Harwood. One of my favorite destinations for diving and underwater photography is the Golden Triangle. This area includes Sipidan, eastern Borneo, Indonesia, Philippines , Papau New Guinea and the Solomon islands. Fish, invertebrate and coral diversity is highest in this area. 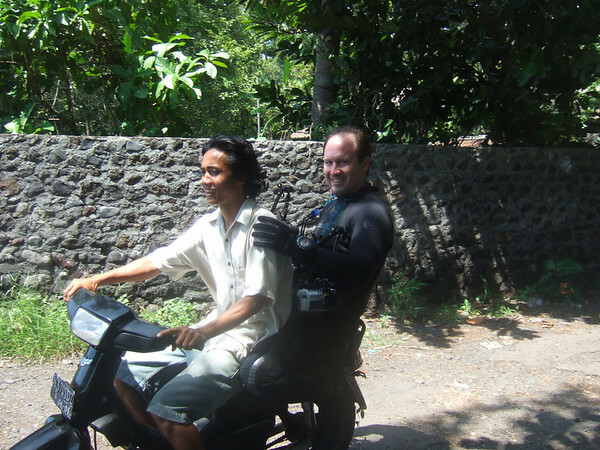 Read all about Diving Bali, one of my favorite spots and diving Bunaken. Dive destinations known specifically for pelagics (whales, dolphins, sharks, tuna) include the following: Palau, Galapagos, Cocos, South Africa for sharks and the Sardine run, Tuamotu and Tiputa pass, Rangiroa in Tahiti for sharks, Fiji (sharks), Bahamas (Tiger sharks & dolphins at Tiger Beach), diving Sipadan (turtles, barracuda, bumpheads), Socorro (mantas & sharks), Kona (manta ray night dive), Maui & Kauai (turtles). Guadalupe island is a prime destination for diving with great white sharks in cages. Read on for more details, or check out our article on must-see Big Animal encounters. Divers visiting Malpelo Island will also be treated to pelagic encounters with hammerheads, mantas and more. Palau is a favorite dive destination for many divers, especially for sharks, large fish, barracudas, bumpheads, napoleans, turtles, mantas, and corals. People looking for small critters may be disappointed. Blue corner is the most famous dive site in Palau, and jellyfish lake is a close second. Many people prefer to do Palau as a liveaboard, because dive sites can be a long boat ride from land-based ops. 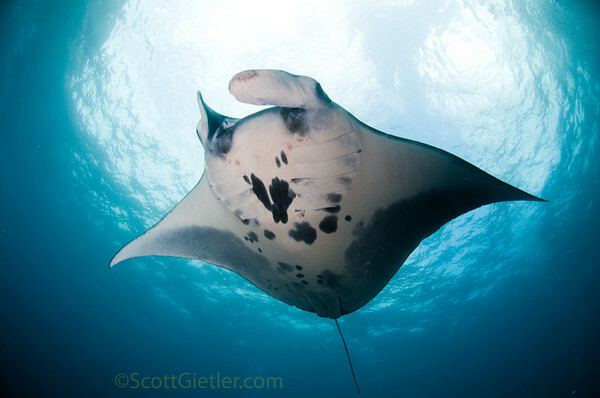 Yap is another destination near Palau known for it's mantas. 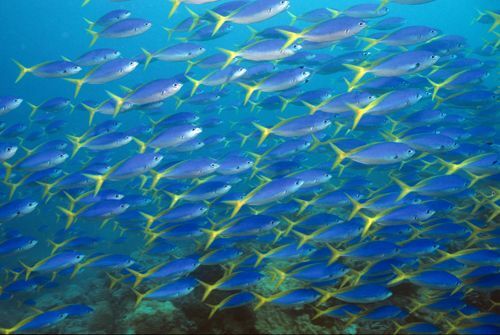 In addition to sharks, Fiji is also famous for beautiful soft corals, beautiful reefs & lots of fish. Fiji is considered the soft coral capital of the world, especially at the north end of the island in the bBligh waters, which has tons of sharks and football fields of soft-corals. Beqa lagoon is famous for shark dives, and the Somosomo strait near Taveuni island is famous for high-adrenaline current dives where beautiful soft corals open up and sharks cruise by. Galapagos and Cocos are considered the best areas for big animal encounters underwater, such as whale sharks and hammerhead sharks, and are among the most sought after dive destinations for pelagics. 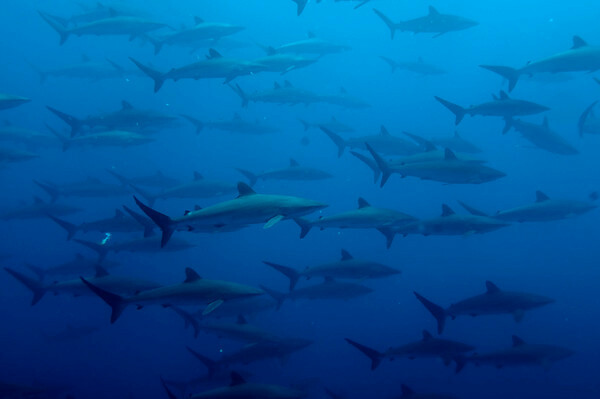 Cocos has large numbers of hammerhead, silky and white-tip sharks, and huge schools of jacks, barracuda, and snapper. There are good pelagics off the South Africa / Mozambique coast, but this area can be hard to get to. I consider this an up and coming destination, especially northern Mozambique. There are lots of fish and coral reefs here also. However, I've already read reports of extreme illegal over-fishing in northern Mozambique, so there may not be a lot of fish left. Maldives, although it can be expensive, offers some great reefs and marine life, and is known for currents, wide angle photography, soft and hard corals and plentiful pelagics such as mantas, reef sharks and whale sharks. Hanifaru Bay offers some incredible manta and whale shark encounters. For non-cage diving, Cocos and Galapagos are the best. The Bahamas (Tiger Beach), Tahiti -specifically the Tiputa Pass in Rangiroa, and Beqa Lagoon in Fiji also have great shark dives. Guadalupe island is well-known for diving in cages with Great White Sharks, and so is Gansbaai, South Africa. Oceanic whitetips are commonly photographed while diving southern Egypt. Shark diving in Cuba is awesome at Jardines de la Reina. Tonga is a popular place to visit to snorkel with Humpback whales, in August and September, although check with the operators to see what the latest rules are that are being enforced. 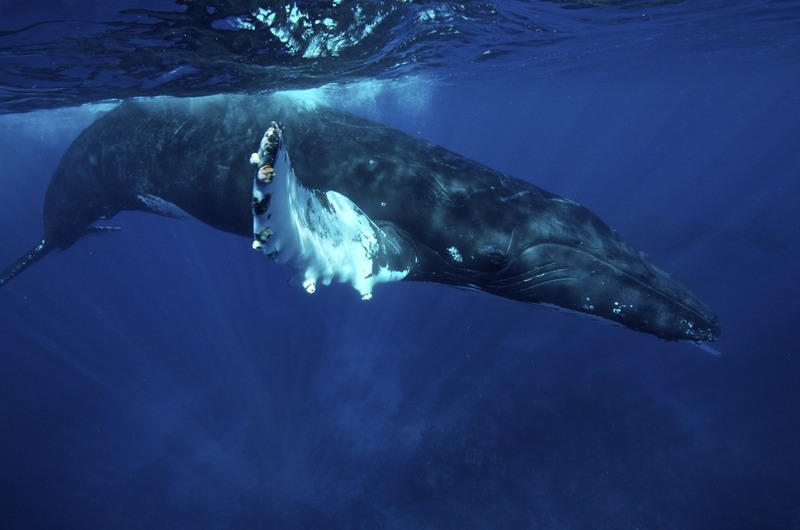 Divers have sometimes had underwater encounters with Humpback whales while diving at Socorro Island, and on a more regular basis from January to March at the Silver bank, which lies halfway between the Dominican Republic and Turks & Caicos in the Caribbean. 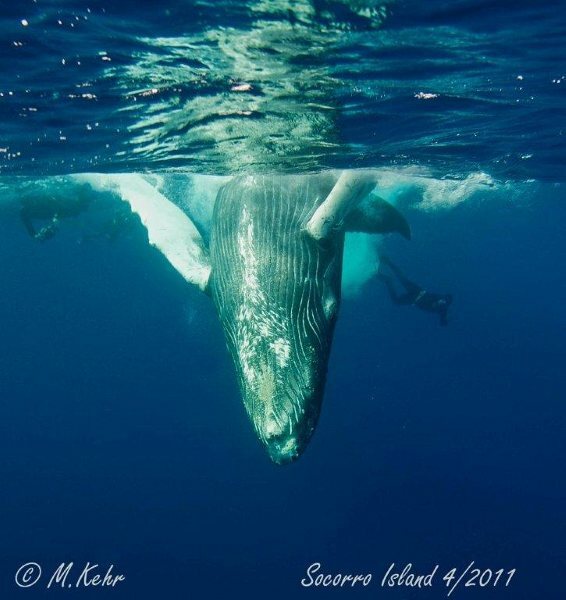 Humpback whale diving in the Silver Bank, Dominican Republic. Photo by Wilfried Niedermayr. Spinner Dolphins can be seen underwater in Fernando de Noronha, Brazil. Socorro islands are another good place to see dolphins underwater, from January through March, along with the Bahamas and the Sardine Run in South Africa. Kona also offers some good dolphin encounters year-round. 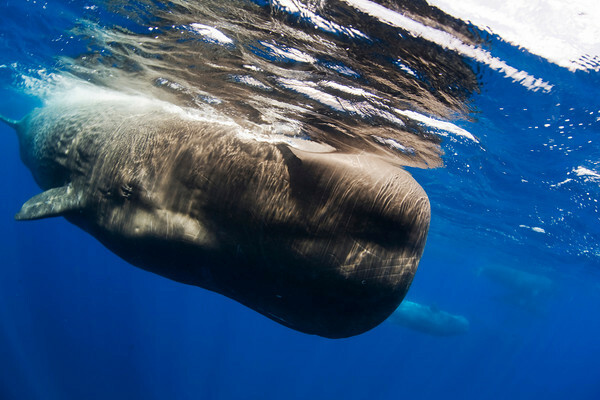 Sperm whales are best photographed underwater in Dominica - which is in the Caribbean, the Ogasawara islands in Japan, or in the Azores. Permits are usually necessary before hand to dive with Sperm Whales. Another great place to see sperm whales is on our Sea of Cortez photo workshop. Whale sharks are seen regularly from November to April in Sogod Bay, Philippines near Padre Burgos, Southern Leyte (late Dec -early Apr is best). Only snorkeling is allowed there with them, although you can sometimes see them at dive sites while on scuba. There's also some good coral and macro/muck dives in the Padre Burgos area. It's a 1-hour flight from Manila to Tacloban, and then a 3-hour drive to Sogod Bay, Southern Leyte. Donsol, Philippines is another excellent place for whale sharks. Best months in Donsol are Late February to April, snorkeling only. Visibility is 5-10 meters. Take a 1-hour flight from Manila and then go by bus for 1 hour to Donsol. Tofo, Mozambique gets a good number of whale sharks in February & March. Ningaloo reef in western australia is also a huge whale shark hotspot, and so are Wolf/Darwin islands in the Galapagos, Hanifaru Bay in the Maldives, Isla Mujeres in Mexico and both Bahia de Los Angeles and La Paz while diving the Sea of Cortez, Baja, Mexico. Djibouti, Africa - near Eritrea and Ethiopia, is also a good place for whale sharks. Here's a great article on diving with whale sharks off of Mexico's Yucatan Peninsula. Sipadan, in Malaysian Borneo, is known for turtles, jacks, barracudas, bump heads, and good muck diving in nearby Mabal. Diving in Sipadan can be crowded, and permits will limit the number of days you can dive Sipadan, leaving you to do muck diving in Mabal and Kapalai for the rest of the time. The Banda sea near Ambon and Flores has lots of color, big sea fans, schools of jacks and a famous sea snake dive. Ganga island near Bunaken has beautiful reefs and a nice resort. The Red sea off the coast of Egypt is famous for some spectacular soft corals, and great wreck and reef dives. It's more convenient to get to from Europe. Ras Mohammed has exceptional beauty, filled with fish, soft corals and anemones. 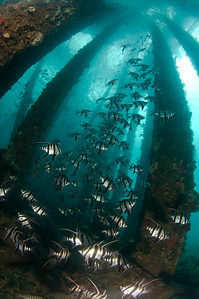 Elphinstone Reef, which is further south, is also popular, perhaps too popular as I hear it's very crowded these days. People also enjoy diving at Marsa Shagra. Areas known for good amounts of medium-size fish include Komodo (best May-Sept), Maldives, and the Sea of Cortez. Komodo islands are usually done as a liveaboard and have great corals, critters, mantas, and schools of fish. The north coast of Flores is not as good so make sure your liveaboard spends most of the time in the Komodo national park. Komodo, Flores, Pantar and Alor make up an area known as Nusa Tengarra. Alor and Pantar are supposed to have some great dive sites near Kalabahi. The Derawan / Sangalaki area in eastern Borneo is known as a good diving destination, with prolific mantas, barracudas, and healthy reef fish, corals, and good macro. 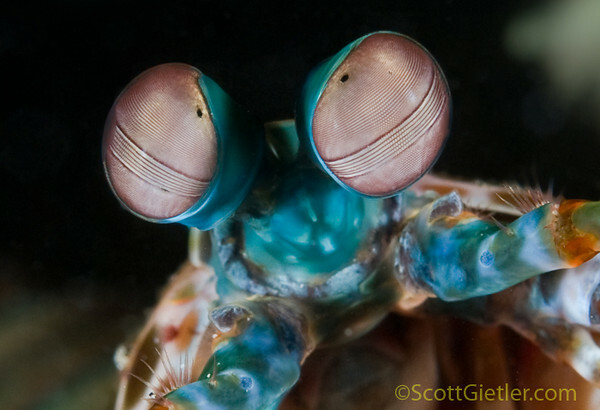 Some of the best Macro / Critter / Muck diving / photography are at places like Papau New Guinea (Kimbe Bay), Lembeh, Anilao, Bali, Mabul (near Sipadan) and to a lesser extent Komodo. These places are best dove with a guide specializing in finding macro subjects, which are easily found in Lembeh and Anilao. Ambon bay, in the Banda islands, is also known for great muck diving, but is harder to get to. Read this article on muck-diving for some more info. Muck diving turn up gems like this Rhinopia in Anilao. Photo by Scott Gietler. No macro dive would be complete without a complete underwater critter list. Check it out - it has over 100 of the most sought-after critters. A select group of underwater photographers love going "branching" - looking for nudibranchs. No doubt Anilao, Philippines is the best destination for branching. Lembeh is also excellent, and the entire indo-pacific area is pretty good. The california coast also has an excellent reputation for nudibranchs, and so does Scotland, according to the scottish nudibranch page. Read the guide to nudibranchs for more details on where to find nudibranchs. Truk Lagoon, also known as Chuuk, is famous for its wreck diving, and there are several photography books out on the shipwrecks of Truk. If you visit Truk lagoon, it will be mainly for the wrecks and not for the marine life. Other top locations for wreck diving and wreck photography include Bikini Atoll, Scapa Flow in Scotland, North Carolina, southwest Norway and Pensacola, Florida. General diving in the Caribbean: Although not as good as diving in southeast Asia, Cozumel (drift dives, turtles, eagle rays), Turks and Caicos, Cayman islands (wall diving, stingrays), Belize and Bonaire (easy shore diving) are some of the better UW photography locations in the Caribbean. St Vincent’s island is known for having some great critter diving, including plentiful frogfish, blennies, jawfish, pipefish and seahorses, but not larger fish. The diving in Cuba can be quite good in some areas. There's great info on many Caribbean destinations here. Bonaire is a favorite carribbean destination for underwater photographers, because the entire island is set up for easy shore diving. Everyone has a rental truck, you simply fill your tank and drie to a dive site. No need to dive with a group or a divemaster. Nitrox is commonly offered, and is highly recommended. The selection of small critters, small fish and wrecks is considered fairly ood for the caribbean, and the visibility is usually outstanding. Unfortunately a recent hurricane damaged the reefs badly in the shallows, and it may take some time to recover. 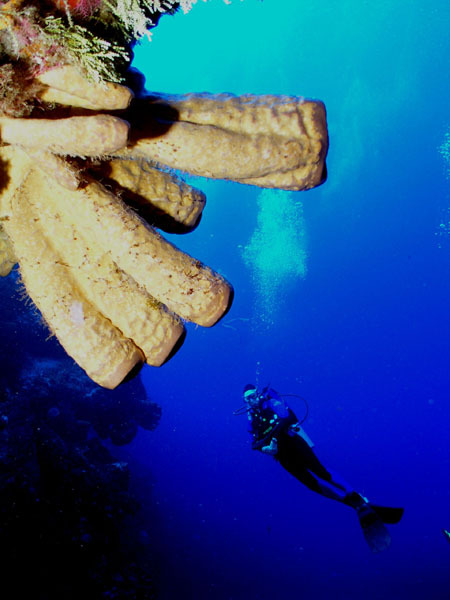 Nearby Curacao has a famous mushroom forest dive with huge corals that look like giant mushrooms. The diving in Cozumel island has some of the best marine life encounters in the Caribbean, and it's one of the most popular destinations for divers and underwater photographers, for good reason. Turtles and eagle rays are common, nurse sharks are often seen, and there are large amounts of tropical fish, and good shore diving for critters. There are many very reasonably prices hotels and dive shops. Diving in Belize also offers similar marine life. St. Croix is a popular destination for people who want to dive, dine, and play golf. It's easy to get to with good wall dives, and an old pier full of colorful sponges,fish, and some critters. St. Thomas is not as nice for diving, and it heavily visited by cruise ships. Roatan has some decent diving with corals, fish, and reef sharks. Diving is inexpensive, and people are attracted to the laid back lifestyle. Caymans islands is a popular dive destination, although it can be a little expensive in some parts. Grand Cayman has a good number of cruise ships and some once-a-year divers, so some people prefer the quieter east end for their diving. Stingray city is a popular location for underwater photography in the north sound of Grand Cayman, because of its large, friendly stingrays. The diving in Little Cayman is also highly recommended, and is recommended for people who want to focus on diving. Hawaii has a diverse number of dive sites and marine life. The "big island", Kauai and Maui all have excellent boat and shore diving where turtles and fish are plentiful. Diving Kona you can experience lava tubes and manta rays. From Kauai, you can take a boat to Niihau to potentially see monk seals or even a hammerhead shark. Norway has a rich abundance of invertebrate life, similar to British Columbia, and the chance to dive with Orcas if you are lucky. Corsica has beautiful red corals, and is the home to many underwater photography competitions. And the Azores Islands are an excellent place for whales, dolphins and pelagics. Central California & British Columbia have rich invertebrate life and lush kelp forests, although the water can get very cold, especially in Monterey and further north. Southern California (the channel islands) can be comfortable dove in a 7mm wetsuit from July to November, which also has the best visibility. 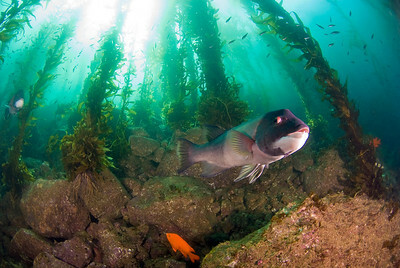 Fish, Sea Lions and invertebrates are prolific in the tall kelp forests. I'm a little biased, but I think Southern California and the Channel Islands offers incredible diving - giant sea bass, angel sharks, harbor seals, bat rays, and loads of macro life. Temperture varies, but is up to 20 celsius peaking in august, and down to 12 celsius in march-may. There's great underwater photography at Catalina Island, and also good macro photography at Catalina. Tall kelp forests await you when you dive Southern California. Poor knight’s islands off the coast off the northern coast of New Zealand is considered excellent diving, with an habitat similar to southern California. Milford Sound diving, on the south island of New Zealand, combines black coral underwater with incredible topside beautiy. Tasmania is a little out of the way, but offers some unique diving. 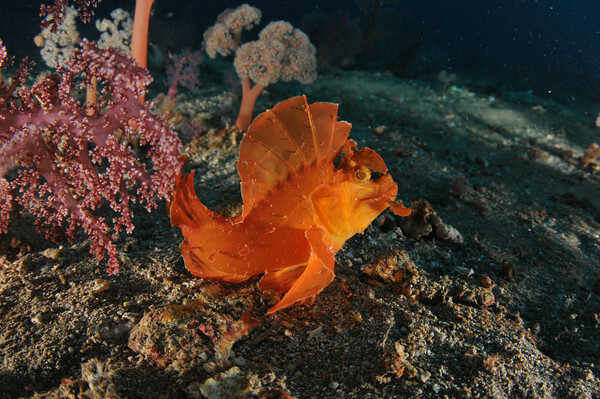 Weedy seadragons, sea lions, kelp forests, and schools of fish await you. Bicheno, Tasmania - on the east coast, is one of the best places to use as a dive base, as is Eaglehawk nest, in the SE corner just east of Hobart. It's cold water diving, 12-18 degrees celsius depending on whether it's summer or winter. Based on the photos I've seen, it reminds me of diving in Monterey, California. Speaking of Australia, Ningaloo reef and Byron Bay look like fantastic dive destinations, they are just a little bit out of the way. I'd love to get there some day. Ningaloo reef is on the west side of australia, and is known for whale sharks, reefs, macro, and great diving in general. Byron Bay is near Brisbane on the east coast, and can be good for sharks, rays, turtles, cuttlefish and reefs. The diving in Adelaide is famous for it's Leafy Sea Dragons, best found at the jetties around Adelaide such as Rapid Bay Jetty. The Great Barrier Reef is a world-famous dive area off the northeast coast of Australia, best done on a liveaboard. The Yongala wreck off the coast of townsville is an incredible dive site teeming with marine life. 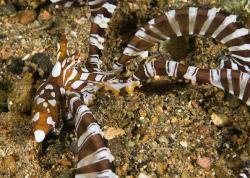 Okinawa has the most famous diving in Japan, with plenty of macro subjects and nudibranchs. Sperm whales visit the Ogasawara islands. Jeju island is the place to dive in Korea, and has plenty of soft corals and nudibranchs. Alaska and Antarctica are extreme environments that probably warrant an entire book on their own. 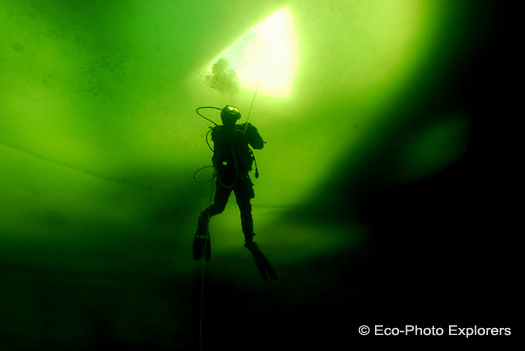 We also have a complete guide to ice diving in Russia, with some spectacular photos. There's also good diving in the Middle East, in places such as Jordan and Oman. Underwater Photos from these destinations? Most of Indonesia, including Bali is best from April to November, although Ambon can only be dove from October to April. Lembeh can pretty much be dove year round. Philippines is best from October to May. June - August can get some typhoons. Many tropical dive spots in the world are great year round. California is best from July 1st to Jan 15th. DiveTrip has excellent information on when to dive the Pacific Ocean and Southeast asia destinations here. Submitted by Brian Schneider (not verified) on Tue, 2012-04-03 02:22. I totally love this site. I was searching for something totally unrelated and came across a picture of yellow tail snapper. I one dove in the Florida keys when I was a teenager and we saw a huge school of yellow tail snapper come up from the blue and over the edge right toward us. As a group we were observing a morae eel hanging in his hole in the coral. So, this all took place in a few seconds as the morea nailed one of the yellow tail snappers...! I was worried about a shark showing up - even though we were in a large group - i was still concerned. Anyway. I thought I would leave a comment on your site because, for me - it brought back some great underwater memories. I WISH I HAD THAT CAMERA! The exterior beauty of that eel was fascinating. Not to mention - the speed was awesome! Power! Ya know, if you stop and look around once in a while you can see some really beautiful creatures that we share our planet with. I am haunted by water! I always find myself dreaming of a new adventure somewhere tropical. Thanks for the experience on your site. I am bookmarking it. I wish I owned an underwater camera! All the best and full oxygen tanks to everyone! Submitted by Brian Schneider (not verified) on Tue, 2012-04-03 02:21. Submitted by Glenn Rankin (not verified) on Fri, 2012-02-17 08:56. What about Long Island New York? Great shipwrecks! Submitted by sophie (not verified) on Tue, 2012-01-31 07:39. I enjoy you because of all your effort on this blog. My daughter takes pleasure in making time for internet research and it's easy to see why. My partner and i notice all concerning the lively manner you present powerful guidelines via the website and even welcome contribution from some others on this subject matter then our favorite child is really understanding so much. Have fun with the rest of the year. You're the one performing a useful job. Submitted by Bill5s (not verified) on Sat, 2012-04-21 18:48. Submitted by Rahul (not verified) on Wed, 2012-01-18 22:57. Submitted by Sarkari Naukri (not verified) on Mon, 2011-11-21 23:04. Submitted by images2inspire on Mon, 2011-11-21 08:54. Just finished a great trip to the Caymans. I also took the time to shoot a photo survey of the USS Kittiwake which has now been on the reef in Grand Cayman about 10 months. It is a great dive site especially for photography. Submitted by Jet (not verified) on Wed, 2011-10-19 08:15. I am an amateur underwater photographer. I just learned for a month. I take underwater photos by Panasonic TS3 waterproof camera for the dept less than 40 feet. After finish the class I plan to by DSLR and waterproof housing for deeper shot. Do you have any suggestion about DSLR for a novice like me? Submitted by Tony Barros (not verified) on Wed, 2010-01-27 11:06. The 60mm and teleconverter. I have seen some the pictures taken with this combo and they look nice and tack sharp. It is my humble (perhaps ignorant opinion) that this combo will give me more flexibility. Which port should I get?